Ergonomically designed to fit in the palm of your hand, Princeton Catalyst Wedges and Contours are exciting new tools for creative expression. They're at home with all heavy body paints — oils, acrylics, and water mixable oils — as well as plaster, clay, and even food crafts. Because they're heat-resistant, they excel with encaustics. Cleanup is a breeze with Catalyst Wedges and Contours — in most cases it can be done with mild soap and water. Solvent-resistant, they are simple to wipe clean, and dried paint can easily be peeled off their surfaces. They're also dishwasher safe. Catalyst Contours — Made of solid nylon, Contours feel natural in your hand with their comfort-touch finish. Their hanging holes are a big help when it comes to studio organization. 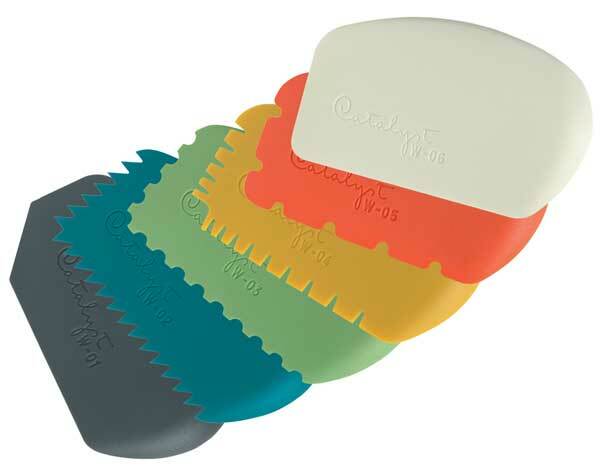 Catalyst Wedges — Offered in six shapes, Wedges are made of flexible, FDA-approved silicone.